I love this unique sloppy joe recipe a friend passed onto me! It comes together in minutes and freezes really well. Its use of gumbo made it a perfect Fat Tuesday menu choice! Prep Ahead Plan: Prepare this meat mixture at any time. Refrigerate and serve anytime that week for an easy heat and eat meal! Freezing the mixture is an option too! Just defrost, heat and serve at your convenience! 1. Brown meat in a skillet. Drain excess fat. 2. Add in onion and celery and saute a few minutes longer. 3. Add remaining ingredients. Bring to a boil, stirring for about a minute. 4. Reduce heat and simmer for at least 20 minutes but longer is fine too! 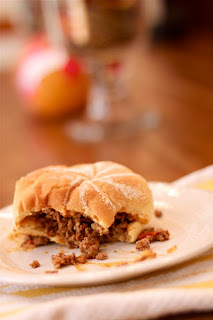 Copyright © PrepAhead and Dine In: Easy Weeknight Sloppy Joes. All Rights Reserved.